For an introduction to this program and sample screenshots click here. From the point of view of an ideal observer at the center of the Earth, the Sun traces out a complete circle against the background of the fixed stars during the course of a seasonal year, and it traces out the same circle every year. This circle is called the ecliptic, and it determines the ecliptic plane. Each planet orbits the Sun in its own orbital plane, and (with the exception of Pluto) these orbital planes almost coincide with the ecliptic plane. Thus it is approximately true that all the planets move in the ecliptic plane, with slight movements above and below it (somewhat larger vertical movements in the case of Pluto). From the point of view of the Earth, at any given time the position (more exactly, the direction) of a planet is specified by a longitude, called the celestial longitude (a.k.a. the ecliptic longitude). If we now take as our point of view, not the Earth, but rather the Sun, then again, at any given time the position (more exactly, the direction) of a planet is specified by a longitude, called the ecliptic longitude. Thus there are two senses of ecliptic longitude depending on whether the point of view is the Earth (geocentric ecliptic longitude) or the Sun (heliocentric ecliptic longitude). In the rest of this user manual, the term ecliptic longitude (or longitude for short) of a planet will mean its heliocentric ecliptic longitude. The chart displayed by this program represents the planets on the ecliptic, as viewed from a position in space directly above the Sun (not the Earth). The ecliptic is divided into 360 degrees. The 3 o'clock position corresponds to zero degrees, and degrees increase anti-clockwise, so 90 degrees is at the 12 o'clock position. For example, see the chart here. 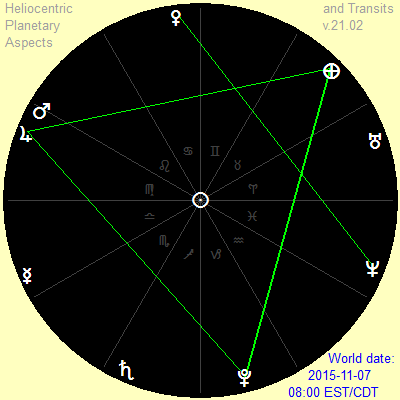 Uranus is at 19°10', which is 19°10' in Aries (as shown in the tabular display below the graphical display). The Earth is at 102°1", which is 12°1' in Cancer. Venus is at 188°14', which is 8°14' in Libra. And Neptune is at 338°56', which is 8°56' in Pisces. When three or more planets are such that each pair of planets forms an aspect then we have what is called an aspect pattern. For a more detailed explanation of aspects and aspect patterns in the context of geocentric astrology see Planetary Aspect Patterns. In heliocentric astrology the aspects and aspect patterns are the same, except that the set of planets is the astronomical set (the nine planets from Mercury to Pluto) and does not include the Sun or the Moon. The image at right shows the simultaneous occurrence of a grand trine (Earth-Jupiter-Pluto) and a T-square (Jupiter-Saturn-Pluto) which occurs on November 7, 2015. If we consider only the aspects shown in the table above, other than conjunction, then there are 12 possible 3-planet aspect patterns, 28 possible 4-planet aspect patterns, 35 possible 5-planet aspect patterns, and 35 possible 6-planet aspect patterns. The total number of such aspect patterns with 3-6 planets is thus 110. If we add two more aspects, namely 45° and 135°, then the numbers increase to 16, 34, 40 and 39 respectively, for a total of 129. As in geocentric astrology, the ecliptic is divided into equal parts called signs, and the parts have the same names (Aries, Gemini, etc.). Geocentric astrology also employs the concept of houses, but this concept does not occur in heliocentric astrology because it depends upon the concept of a particular position on the Earth (usually the place where a person is born). As in geocentric astrology, the natal chart of a person is the set of positions of the planets at the time of a person's birth, but in heliocentric astrology this is the set of heliocentric positions rather than the set of geocentric positions. A transit occurs when an actual (that is, a moving) planet forms an aspect with a planet in the natal chart, so transits occur over a period of time. One may also use the term to mean an aspect between two actual (moving) planets lasting a certain period of time. The duration of a transit may be short (perhaps just hours) or long (perhaps years), and depends on the value assigned to the orb for that aspect: the larger the orb the longer the transit. The natal chart: The positions of the planets relative to the time ... of an individual's birth are regarded as bearing a significant correspondence to the person's life as a whole, reflecting the specific archetypal dynamics and relationships expressed in his or her specific psychological tendencies and biography. Personal transits: The positions of the planets at any given time in relation to their positions at an individual's birth are regarded as bearing a significant correspondence to the specific experiences of that person at that time, reflecting a dynamic activation of the archetypal potential symbolized in the natal chart. World transits: The positions of the planets relative to the [Sun] at any given time are regarded as bearing a significant correspondence to the prevailing state of the world, reflecting the state of collective archetypal dynamics visible in the specific historical and cultural conditions and events of that time. In all three forms of correspondence, the particulars of the planetary interaction — which planets are involved and how they are geometrically aligned with each other — are considered to be the most important determining factors in understanding the corresponding human phenomena. When a date is specified (whether world date or birth date) a time may optionally also be specified. If no time is given then it defaults to 12:00. The time may also be qualified by reference to a timezone. If no timezone is given then it defaults to the local timezone (the timezone of the computer being used). So, for example, if a person is known to have been born at 3 p.m. in Rome, Italy, then the time should be specified as 15:00 GMT+1:00. The configuration panel allows inclusion or exclusion of U.S. timezone abbreviations such as PST and PDT. The range of dates which may be entered is from January 1, 1 CE, through December 31, 2799 CE. 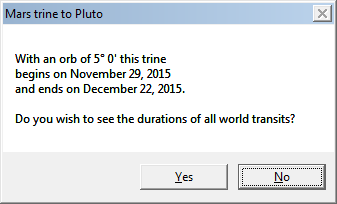 The ecliptic longitudes of Uranus, Neptune and Pluto cannot be calculated by this software for dates prior to January 1, 1600 CE, so for such dates these planets will not appear in the table or in the graphical display. The ecliptic longitude of Pluto cannot be calculated for dates after December 31, 2199 CE, so for such dates Pluto will not appear. Clicking on the 'Now' button sets the world date to the current date, time and time zone, as read from your computer. To calculate world transits for a particular date, to get a natal chart for a person's birthday, to get the personal transits for a particular person at a particular world date or to calculate the synastry for two people, enter the appropriate dates and select the output desired. When changing dates and times by means of the drop-down menus you may need to click on the 'Compute' button to get the result in tabular or graphical form. Do this especially if the 'Display chart' (which changes to 'Display table') button is not visible. You can easily switch back and forth between the tabular display and the graphical display using this button. The results are displayed in a table, and can also be displayed graphically. An example of tabular and graphical results for a world date are given in the Introduction. The angle values in the table give the difference in degrees and minutes from the exact value of an aspect. For example, if Mars and Venus are shown as Sqr 3° 0' that means that the difference in their longitudes is 3° away from the exact value for a square aspect, namely, 90°, so that difference is between 87° to 93°. A '+' following an angle value means that the aspect is increasing at the date and time shown, and a '-' means that it is decreasing. Aspect patterns with three or four planets have an "av." value shown. Each aspect in the aspect pattern differs from an exact aspect by a certain amount, and the "av." value is the average of these differences. 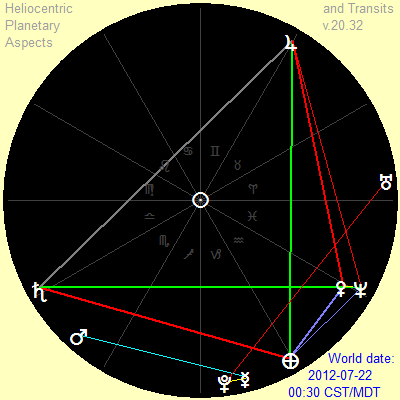 For example, a Jupiter-Mercury-Earth T-square may be composed of a Jupiter-Earth opposition with exactness of 0°37', a Jupiter-Mercury square, 1°43', and a Mercury-Earth square, 2°20', with average difference-from-exact of 1°34'. By moving forward and back by a day or a half-hour one can find the date (and time) at which the average value is a minimum and thus the aspect pattern itself is most exact. 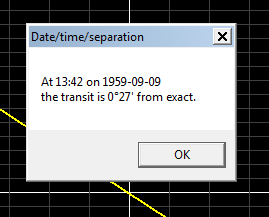 With world transits, double-click on an aspect (in the table) to display the duration of the transit, as illustrated at right. The same kind of report is available for personal transits by clicking on the 'Report' button. In heliocentric astrology all transits are linear, in contrast to geocentric astrology, where (due to planetary regression) transits may be sigmoid, as shown here in the image of the geocentric Uranus return for C.G.Jung. Al three exact geocentric conjunctions of transiting Uranus with natal Uranus occurred before the exact heliocentric conjunction (August 3, 1959). Right-mouse-click on a (non-black) pixel shows the corresponding date and time, as shown at right. 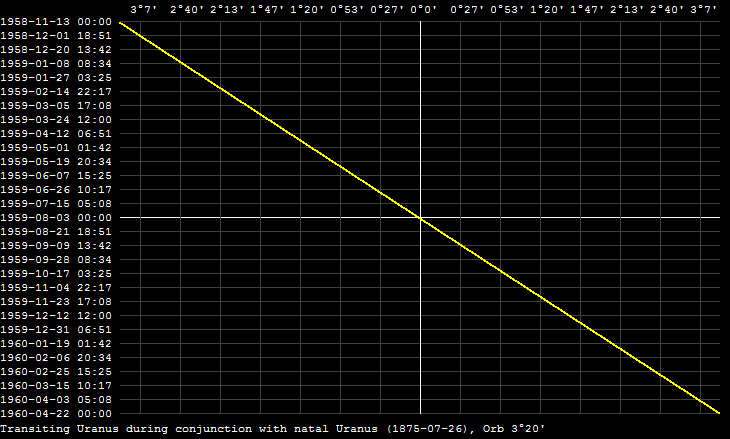 For aspects other than conjunction, the graphs show the difference when the longitude of the transiting planet is offset by the appropriate amount (e.g., 90° for squares and 120° for trines). These graphs can be saved as PNG files by clicking on the 'Save image as ...' button. The 'Forward' and 'Back' buttons move forward or back by the selected period: 30 minutes, 1 day, 1 week, 1 month or 1 year. When the chart (the graphical image of the location of the planets) is displayed, a 'Run' button appears. This is used to run the graphical display forward by 1 day, 1 month or 1 year until stopped. The state of the program (that is, the values of the settings) can be saved via the 'Save as ...' button. This is useful for saving a particular person's birth date (so the file should be named after them) and for saving a particular pair of birth dates (again with the file named appropriately). A file so saved can then be loaded again later to restore the program state. Program state files always have extension pat. The saved-state HPAT files have the same format as the saved-state PAT files, so it's possible to save an HPAT state and load it into PAT so as to compare easily the geocentric and heliocentric configurations for a single date and time. When the graphical image is displayed the 'Save image as ...' button allows you to save the image to a PNG file. See Planetary Aspect Patterns for an explanation of aspect patterns from a geocentric point of view. The concepts carry over exactly to a heliocentric point of view except that the Sun is replaced by the Earth. A rare aspect pattern called a trapezium (quincunx base) is shown at right. This planetary configuration occurred on July 22, 2012. Actually there are two such trapeziums present, since Venus and Uranus are conjunct. The other three planets involved in these two trapeziums are Saturn, Jupiter and the Earth. This software makes it easy to search for the more common aspect patterns (such as grand trines) and for a certain number of aspect patterns of one kind occurring simultaneously. The search function is available only for world transits, not for personal transits, and you can only search forward, not back. Select the world date (and time) at which you wish to begin the search. If the table is displayed then click on "Display chart". Set the step size for the search ("1 day" is recommended). Click on "Run". A window then opens which allows you to select the aspect pattern you want to search for (e.g. a yod). If you want to search for two or more such patterns occurring simultaneously then check the "Find at least" box and specify the number. Check the "Run quickly" box. Click on the "Run" button. The program then calculates a series of charts according to the step size and stops if and when it finds the specified number of aspect patterns of the specified kind. It is possible to search for a particular kind of aspect pattern involving up to three specified planets, e.g., to search for a grand trine involving Earth and Pluto (such a grand trine, occurring on November 7, 2015, is shown at right). An explanation of this given at How to Find Heliocentric Aspect Patterns with Specified Planets. Clicking on the 'Configure' button brings up the panel shown at right (which shows the default values of the settings). When two planets form an aspect, that aspect may be exact or it may differ from exactness by some number of degrees. The number of degrees which is acceptable is called the orb. The orb affects the number of aspects (the larger the orb the more aspects). Orbs for personal transits are specified as some proportion of the orbs for world transits; this can range from 1 to 1/5. These orbs apply equally to all planets. Synastry orbs can be set in the same way, independently of the orbs for personal transits. The midpoint orb is set separately. Any of eight values can be selected, from 0° 5' to 3°. The larger the midpoint orb, of course, the more midpoints will appear. To avoid an excessive number, the midpoint orb should normally be set to 1° or less. 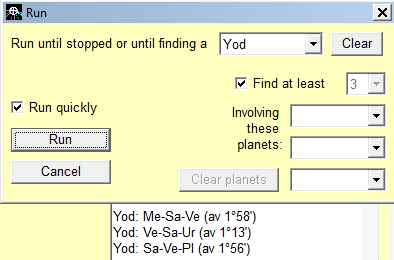 When the 'Show only Earth aspects in chart' checkbox is checked then only aspects between the Earth and other planets are displayed in the chart. When the 'Show only outer planet aspects in chart' checkbox is checked, then only aspects involving any two of Jupiter, Saturn, Uranus, Neptune and Pluto are displayed in the chart. Changes to the settings do not take effect until you click on the 'Use settings' button. You can cancel any changed settings by clicking on the 'Cancel' button. In this software each of the seven aspects has its own color, as shown above. You may assign any of twelve different colors to the aspects by left-mouse-clicking on the colored lines in the Configuration window. For example, if you wish to have conjunctions colored yellow, oppositions and squares colored red, and trines and sextiles colored dark blue, then you may do so. Right-mouse-clicking on a colored line will set the aspect color to black. In this case the aspect does not appear in the table or in the graphic, but it is still counted, and an aspect pattern including this aspect is still counted. When an aspect color is black, right-mouse-clicking on the aspect color box will restore the original color. 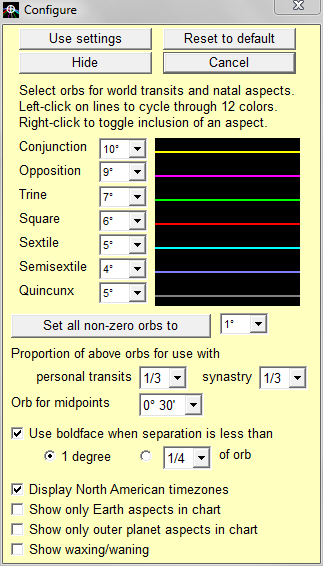 You can also specify when an aspect is shown as "close" by specifying that boldface (in the table) or a thick line (in the graphical display) should be used when the separation is (a) less than either one degree or (b) less than a certain proportion of the orb (the proportion can be selected from nine values in the range 1/20 to 1/2). The checkboxes for color and boldface apply also to the graphical display. If the boldface checkbox is checked then lines joining planets in the graphical display are thick if the separation is less than 1° or less than the specified proportion of the orb, otherwise they are thin. In geocentric astrology one may use either the tropical zodiac or the sidereal zodiac (which are briefly explained here and in more detail here). In heliocentric astrology there are also two possible zodiacs, but it is not necessary to consider which to use, since one of them is clearly better than the other. They are called 'the ecliptic of date' and 'the J2000 ecliptic'. The ecliptic used in this software is the J2000 ecliptic (defined below). The concept of the ecliptic was explained above. The ecliptic is divided into 360 parts, called degrees, which are numbered from 0 to 359. A point on the ecliptic (actually, a direction from a central point, either the Earth or the Sun, out into space) is specified by a number of degrees (from 0 to 359) plus a number of minutes (0 to 60) plus —if greater precision is needed — a number of seconds (0 to 59). The ecliptic is divided into twelve equal parts of 30° each, which are named Aries, Gemini, etc., according to traditional Western astrology. The direction (from the central point) which is identical to the first point of Aries is thus called 0 degrees Aries. So to define an ecliptic properly we must specify — in terms of actual physical space — which direction 0 degrees Aries is. The sidereal zodiac (used mainly in Vedic geocentric astrology) defines this direction as the line drawn from the Earth to a particular star. Since the stars are so far away, this direction never changes, despite the motion of the Earth around the Sun. The tropical zodiac (used mainly in Western geocentric astrology) defines this direction at the line drawn from the Earth to the Sun at the moment of the vernal equinox (which occurs on or about March 21 each year). However, the direction of this line changes very slowly over time. The vernal equinox occurs when day and night are of equal length, and this occurs when the direction of the Earth's axis of rotation is perpendicular to the line connecting the Earth and the Sun. However, the direction of the Earth's axis of rotation changes very slowly, over a period of about 25,000 years (a phenomenon known as the precession of the equinoxes). Thus the direction of the line joining the Earth to the Sun at the vernal equinox also changes. However, in heliocentric astrology we need, for the purpose of defining 0 degrees Aries, a direction from the Sun which does not change over time. Astronomers (and, following them, heliocentric astrologers) take this direction to be the direction from the Sun to the Earth at the vernal equinox of the year 2000. The ecliptic so specified is thus called the 'the J2000 ecliptic'. Using this ecliptic we can meaningfully compare the positions (by longitude) of the planets across thousands of years (and in particular the position of a planet at some time with its position at some other time), which we could not do if we used the ecliptic specified by the direction of the Earth from the Sun at the vernal equinox in the current year — the so-called 'ecliptic of date'.